Welcome to Hivemapper. Get familiar and learn how to build maps with Hivemapper using these guides, tutorials, and examples. Can’t find your answer? Get in touch with our team Mon-Fri 9am-5pm Pacific and we’ll help hi@hivemapper.com . 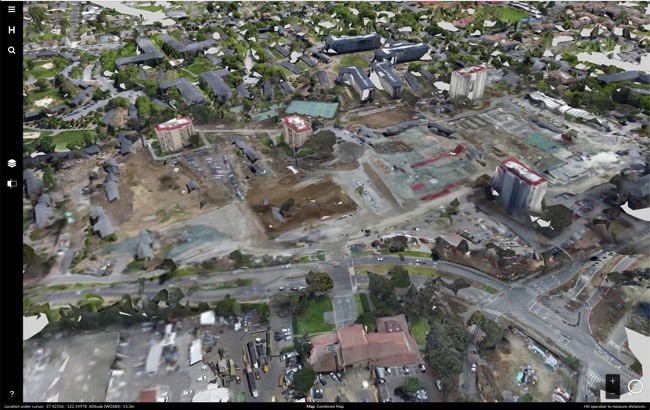 Hivemapper is a mapping service that helps you build 3D maps that see and reveal changes in the physical world. 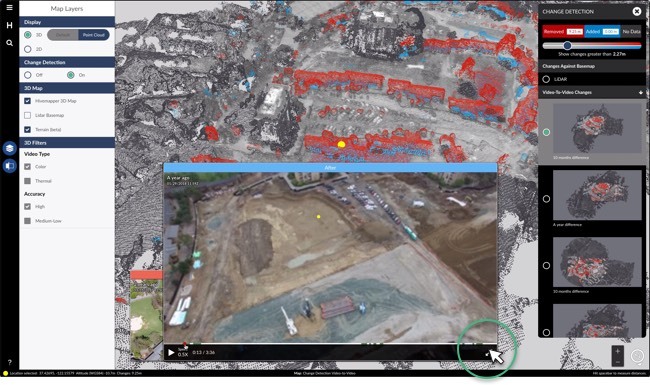 By uploading video you can build small (building) or large (entire cities) maps that help you understand what is changing. This step-by-step guide will cover the basics of getting started. A computer and internet connection - if you can see and use this map you are set. You can use our public maps on hivemapper.com/3D without creating an account. To build maps or use private maps you'll need to create a Hivemapper account. In order to build fresh maps you need to collect some video. 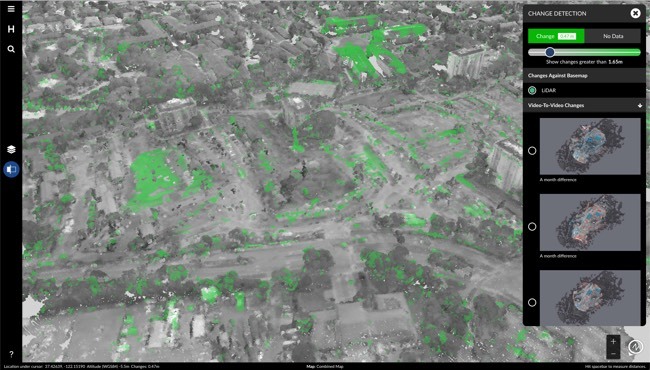 Hivemapper currently works best with airborne video with plans to support ground collection soon. Here are some guides Hivemapper has created for common collection methods. When uploading the video files make sure you are uploading from a location with a stable Internet connection. Sign in and go to your Dashboard page. Drag your video files and any corresponding metadata files into the uploader. Give your upload a batch name if desired. Adjust the Map Resolution if desired. We recommend Normal for most footage. High takes longer to process but may result in slightly more detailed 3D data and Low is ideal if you need your videos processed as soon as possible. Click Upload to begin uploading your video(s). When your upload is complete you will receive an email notification. Click Done. Monitor your video's progress on the Dashboard page. Depending on how many videos you uploaded this can take 30 mins or up to a few hours. 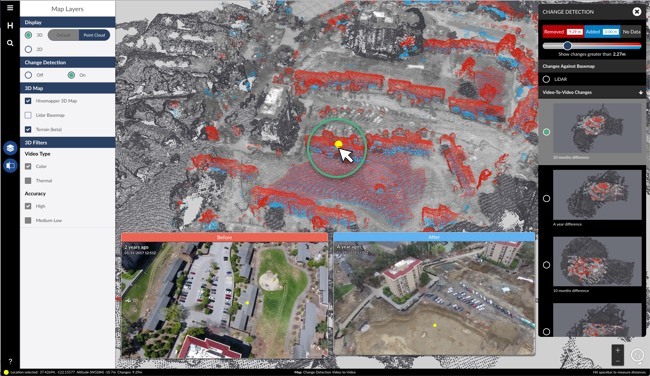 Once Hivemapper transforms your video into a 3D map you can view your map. Select a video with some green in the progress bar. Click the View all maps from this video button. You are now looking at all the maps generated from that particular video. The mapping engine splits most videos into multiple segments and you can view the individual segment map by selecting a segment and clicking View 3D Map. Segments in blue are currently processing and segments in red have failed. Read more about video segments. When viewing video segment maps you will see a notification that you are Viewing individual segment maps. By clicking View global 3D map you can switch to viewing all maps available for that specific location. Not all videos are mapped accurately enough to register to the global map, yet these videos will still be available as single standalone maps. Learn all about using our map to search, get coordinates, measure, and more. Change Detection automatically detects all changes in 3-dimensions. Change Detection requires a before and after. Turn on Change Detection with the button on the left toolbar. The Change Detection map will appear. 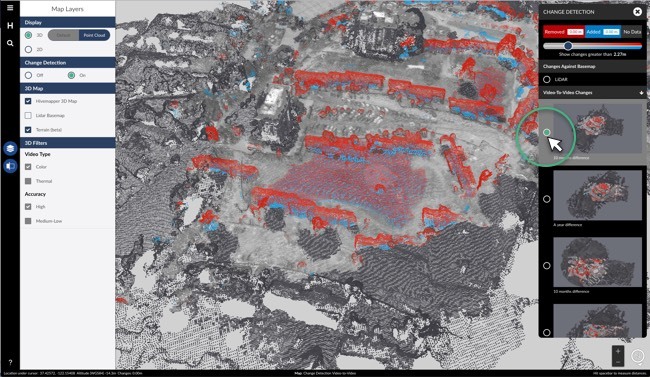 If you collected video in an area where we have LiDAR coverage you will see this map. If not, you will need to do another collection in same area to build Change Detection maps. Click the the first Change Detection map in the list under video-to-video changes. Click on any area in the map to reveal the before and after videos for that spot. Expand either video from the bottom right corner of video. Green bars on video timeline reveal all the places where your selected spot in #5 appear in the video. Have questions or issues? Get in touch with our team hi@hivemapper.com and we'll respond Mon-Fri 9am-5pm Pacific.